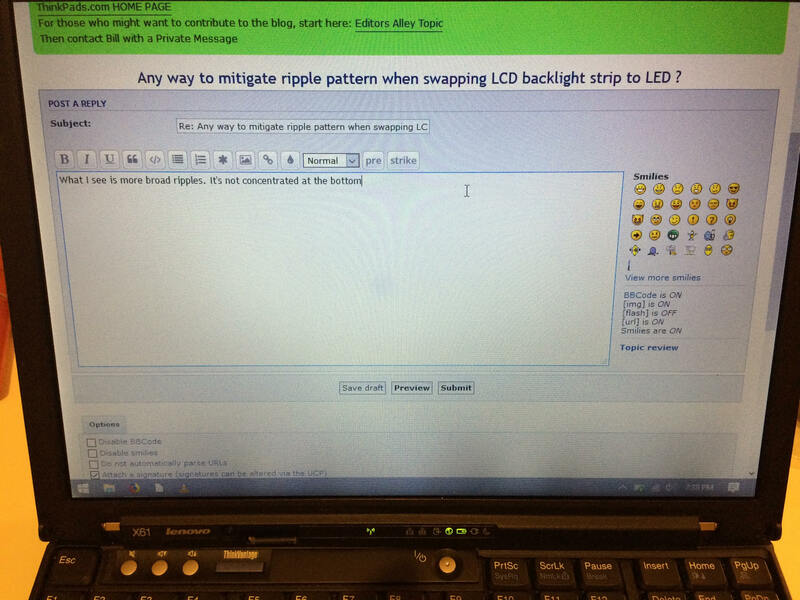 Topic: Any way to mitigate ripple pattern when swapping LCD backlight strip to LED ? Re: Any way to mitigate ripple pattern when swapping LCD backlight strip to LED ? It's good to know someone else has this issue as well. Do you know of any known ways to fix this? Otherwise I'm just going to try to make an accordion shim and see if that fixes it. And is the 1080p connector kit compatible with both the 12.1 and 13.3 inch displays? Is there any way to fix that? I'm thinking of putting in an accordion shim to see if that will help, or maybe just try to put them in even looser. Unless that's permanent damage. Hm, they only really became noticeable after the LED mod, but I can't be certain. I called Lenovo support, and they said it should be fine. Might call them again for a more detailed explanation. Might be with how much isopropyl is used and for how long? Is that normal? Did I put it in too tightly? It's not an SXGA screen.